Sunny southern California hasn’t been so sunny lately. Last year by this time the dahlia bed by the fence was in full bloom. These are the first flowers to actually bloom in the gloom. Even the dirt turned purple in this photo. Since the sun disappeared weeks ago I am noticing other things disappearing too, like my cable needle and my favorite mechanical pencil. This entry was posted on Sunday, June 14th, 2009 at 3:00 am and is filed under Garden. 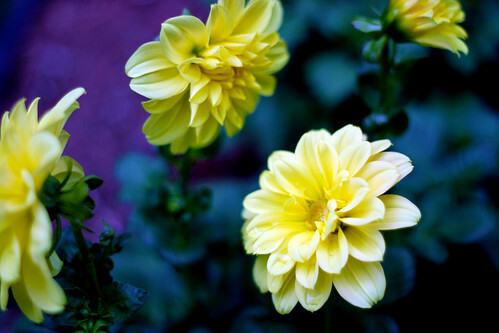 Tagged: Dahlia, Garden. You can feed this entry. You can leave a response, or trackback from your own site.